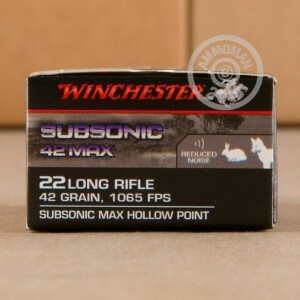 Load up your favorite squirrel slayer with these 42-grain loads from Winchester and you'll stock the freezer in no time and have a blast doing it! 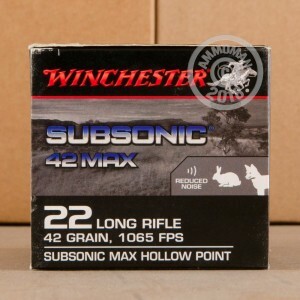 These .22 Long Rifle cartridges are loaded for subsonic performance which exhibits a softer noise over distance alongside near-quiet report when combined with a silencer. This helps hunters protect their ears while avoiding detection by far-off crows, rabbits, and squirrels for high-volume hunt days. Each round uses a lead hollow point (LHP) projectile with a rounded nose which offers reliable feeding in semi-autos and bolt-actions as well as slick insertion into cylinders and side-loading gates. The heavy weight, large diameter cavity mouth, and bare lead construction all contribute to greater expansion and massive terminal energy at the onset of target entry. This results in clean, humane drops on small game targets for minimal suffering and less time spent trekking through the woods. In addition, the bullet is encouraged towards better stability via its large collar which makes better contact with barrel rifling; this tightens groups downrange and gives shooters greater confidence in their hunting ammunition. 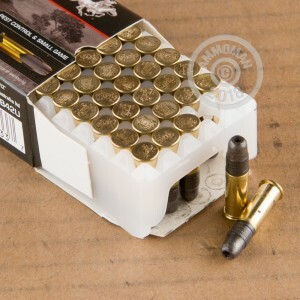 Each bullet is secured into rimfire brass casing and propelled by clean-burning powder which is igniting by a toxin-free primer mixture. Winchester ammunition is manufactured in Illinois and built using processes and quality checks that have undergone constant refinement over the past 150 years.